Greithwald wood burning cookers provide radiant heat that offers high efficiency and health benefits. Evenly distributed heat that maintains the temperature constant, avoiding great differences in heat. The heat does not dry mucous membranes or throat, without the use of humidifiers. 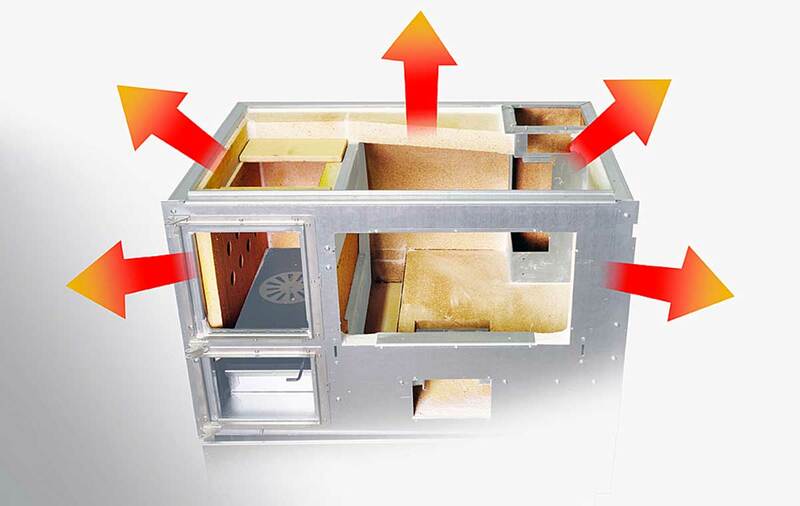 Very high efficiency up to 85%: after several tests, Greithwald technicians have designed and developed a particular patented firebox which, through the balanced use of primary and secondary air, optimises the combustion of wood, significantly reducing emissions. To optimise the efficiency of the process, the combustion chamber is fitted with a grid that can be closed: this solution, invented by Greithwald, allows the complete combustion of the materials, avoiding that unburnt embers fall into the ash pan. Environmentally friendly combustion with zero impact on the environment as regards the amount of CO2 released, as the carbon dioxide balance remains neutral. The combustion produces a minimum quantity of ash that can be used as fertiliser. Fuel that certainly costs less than other types of resources such as methane and diesel; it is available in nature and is less influenced by market trends. Reduced maintenance costs thanks to the lack of mechanical moving parts and electronic components. Well calibrated combustion that reduces to a minimum special cleaning operations. A system that can contribute to achieving a high house energy efficiency class certification. Cooking system that enhances the flavour of food adopting healthy preparation methods. Integration of the boiler cooker with the heating system thanks to a specially designed system; the wood burning cooker can be used to manage the heating of the whole house with great savings.